Tempeh has made its way in and out of my house many times. In the past, I used it to make an awesome vegetarian chili with tempeh (which I still need to get on the blog), but for some reason, it stopped having a place in my fridge. It may be because my husband has never been a huge fan of tempeh, but I’m not sure. Whatever the reason, on a recent grocery trip, I found myself craving tempeh again, and I created this new Crispy Tempeh Arugula Sandwich w/Roasted Garlic Truffle Aioli. Now tempeh will have a more permanent place in my fridge! I find plain tempeh by itself to be boring, bland, and flavorless. It’s like tofu in the sense that it takes on the flavor of anything you add to it and needs to be marinated and cooked right to transform it into something delicious. However, unlike tofu, tempeh has this great natural texture to it. After my Crispy Mushroom Avocado Sandwich addiction, I knew it was time to create another sandwich and show my husband how delicious tempeh can be when made right. This sandwich is very easy to prepare. 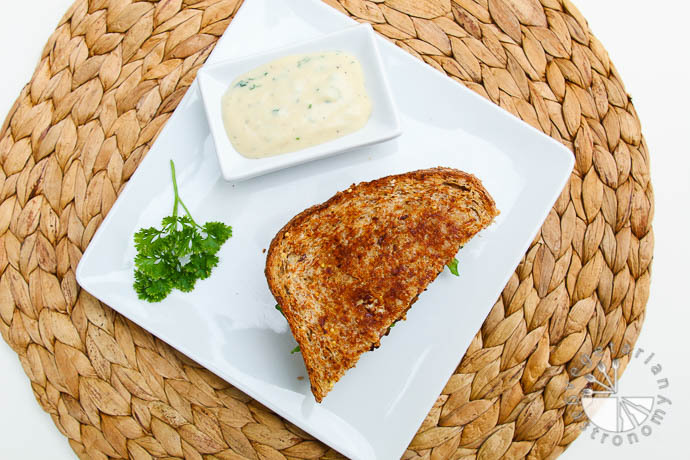 You can easily make the tempeh and aioli ahead of time, and simply grill the sandwich any day of the week when you’re ready to serve and have lunch ready the next few days (which is a win for me since I barely have time to make myself lunch most weekdays). 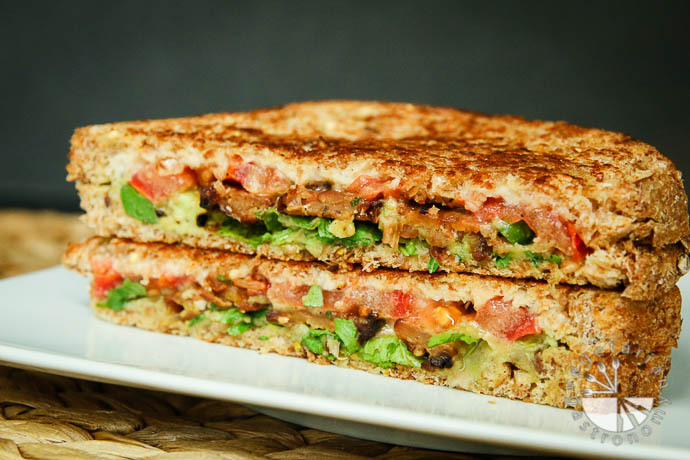 Yes, I said few days, because you will crave this sandwich for lunch again and again. I think the first time I made it, I had it 3 days straight for lunch. 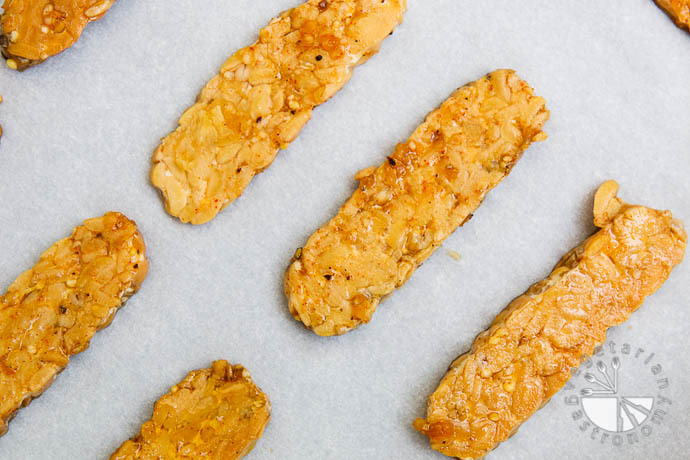 Although I have to warn you, the hot crispy baked marinated tempeh that comes out of the oven is oh-so-addicting! I couldn’t keep my hands off of it! I ended up eating the crispy tempeh by itself the first day I made it, and didn’t even get to making my sandwich. It was that good! Luckily I stopped myself and we had enough baked tempeh slices for lunch the next day. If you’re still skeptical about using tempeh, just try this Crispy Tempeh Arugula Sandwich w/Roasted Garlic Aioli! 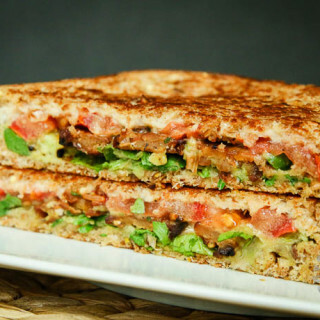 It will make you a tempeh-lover, or a tempeh-sandwich lover at the least! Marinated and baked tempeh sandwiched inside this delicious sandwich and paired with a vegan Roasted Garlic Truffle Aioli! Prepare the marinade by combining all ingredients listed under 'Tempeh Marinade' above in a bowl. Whisk to combine. Add the sliced tempeh to the bowl and gently toss to coat the tempeh with marinade. Cover and place the bowl in the fridge. 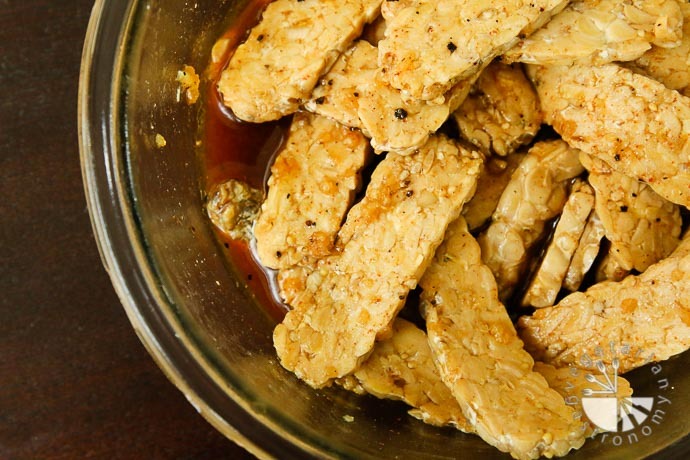 Allow the tempeh to marinate for at least 2-3 hours or overnight if possible. Gently toss once in between while marinating to get even coating. When you are ready to bake the tempeh, preheat the oven to 350 degrees and remove the marinated tempeh from the fridge. Line a baking sheet with parchment paper . Place the slices of marinated tempeh on the lined baking sheet in a single layer. 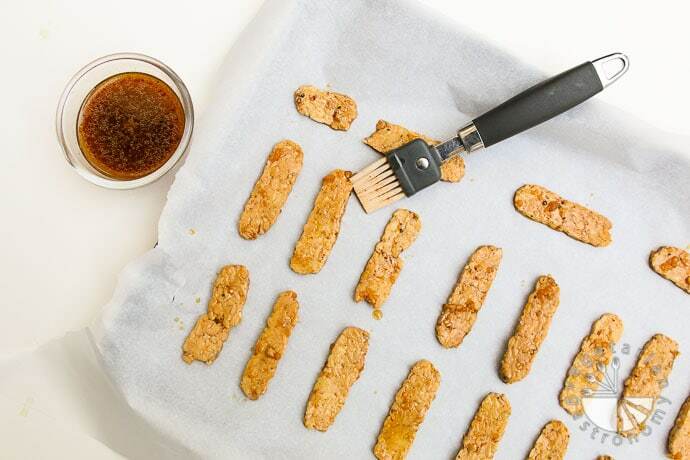 Using a basting brush , brush some of the leftover marinate in the bowl once more on each slice of tempeh. Bake for 10-15 minutes until browned and crispy. Remove from oven, flip each slice of tempeh, brush leftover marinade on top of each slice once more, and place back in the oven for an additional 10-15 minutes to cook the other side. Note that oven temperatures may vary so be sure to check while baking and flip the tempeh over after it's browned and crispy to avoid burning the tempeh. Completely mash the avocado in a bowl. Season with a little salt and pepper (optional). Grill two pieces of bread on both sides on a pan with a little olive oil or vegan butter until golden brown. Let them cool slightly to avoid moisture build-up on the bread. Spread a layer of the mashed avocado on one slice of bread. 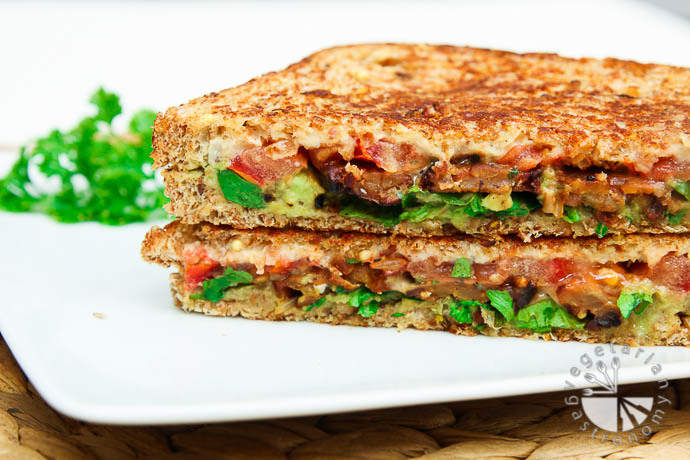 Top with a layer of baby arugula leaves, followed by 4 pieces of the prepared crispy tempeh, and a layer of sliced tomatoes. Spread 1-2 tbsp of the prepared Roasted Garlic Truffle Aioli on the other slice of bread and close the sandwich. Press together gently. Repeat to make two more sandwiches. Cut the sandwiches in half and enjoy! I think you'll like it! You can also simply use the tempeh over salads or even in a wrap. This is one of my new favorite sandiwches! Where do you purchase your tempeh and what brand? I typically get my tempeh from Trader Joe's or Sprouts Market. The TJ brand or Light Life brand, but be sure to get the plain tempeh. I think any brand should work ok. Let me know if you make this sandwich! You will love it! I've even thrown the crispy tempeh into a kale salad or had it plain and it's delicious! Hi Anjali, I tried this recipe at home the other day. It turned out very delicious. One of the best sandwiches I have had. Thank you for posting this. Thank you!! So awesome to hear that it's one of the best sandwiches you've had! 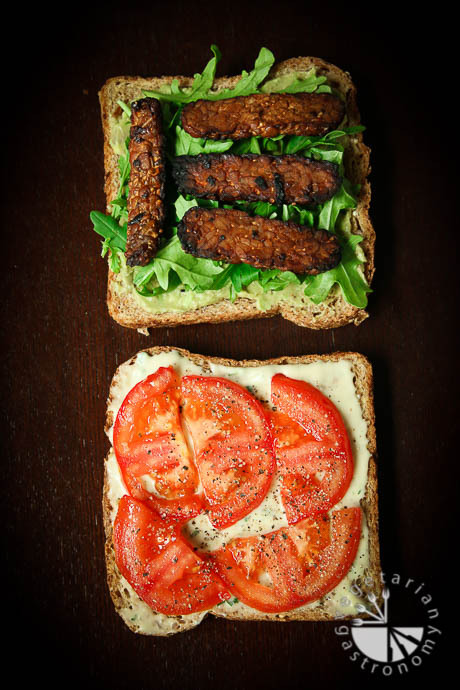 I actually just made the baked tempeh strips today, but ended up eating all of them plain before getting them in a sandwich =) Thank you again for trying out the recipe, following, and letting me know. I appreciate the feedback! If you like mushrooms, try my crispy mushroom chipotle aioli sandwich next! I am trying to make this sandwich too. Put tempeh for marinating???? You will love it! I end up eating half the baked tempeh plain...it's delicious! Let me know how it turned out! Ha! That sounds like my first experience when I first developed these! Aren't they awesome? I've actually made the crispy tempeh a LOT...and typically end up having it as a side. It's easy to marinate a bunch and have it throughout the week. Thanks so much for trying it out and the awesome review!! Love crispy tempeh! and that aioli!! LOVE this recipe! just finished cooking the tempeh after marinating overnight and the sandwich was incredible! I can’t wait to put this tempeh on everything, this recipe will definitely become my new go-to. Isn't the tempeh amazing?? I've even just made a bunch and had it on the side! The sandwich just takes it to the next level...thanks for the great feedback!